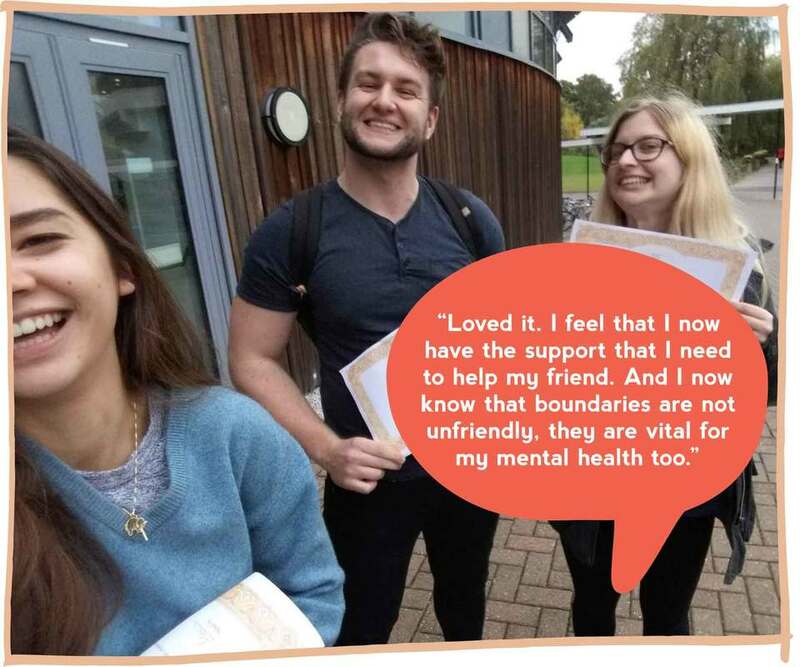 Look After Your Mate is a 2-3 hour interactive workshop for students who may be supporting a friend experiencing mental health difficulties or would like to know more about mental health, the support available for university students, and how to look after your own wellbeing whilst at university. The workshop is delivered through trainer presentation, group discussion and individual and group activities. It is a confidential space, and you will not be expected to share anything personal. The workshop is not a therapeutic space, however if during or after the workshop you feel you need further support or guidance, the trainer will be on hand to connect you to relevant support. You can see if your university runs Look After Your Mate workshops below. To enquire about the next available workshop at your university please check your university and Students’ Unions’ websites or contact Student Minds to be connected to the relevant trainer. Mental Health in Sport is a 90 minute workshop designed specifically for students involved in university sport. The workshop is relevant to captains, committee members, whole sports teams and individual team members. It provides an overview of how best to support a team mate experiencing mental health difficulties, ensuring that the club’s activities and individuals within the club are supportive and inclusive. It is helpful to have an entire sports team attend the workshop together. You may also find our guide for university sports departments helpful, available here (link). You can see if your university runs Mental Health in Sport workshops below. To enquire about the next available workshop at your university please check your university and Students’ Unions’ websites or contact Student Minds to be connected to the relevant trainer. Does my university deliver the workshop? All trainers come from a variety of backgrounds, roles and experiences and all have been trained by Student Minds. Look After Your Mate trainers may be counsellors, mental health advisers, disability advisers, Students’ Union staff or accommodation staff, to name a few. Mental Health in Sport trainers may be staff involved in sports development, BUCS, the Students’ Union, or Athletics Union. Are the people delivering the workshop trained? Yes! As well as having a range of professional backgrounds, Look After Your Mate trainers have attended a one-day training course delivered by Student Minds. Mental Health in Sport trainers have attended two days of training, covering Mental Health First Aid and Student Minds one-day training course. The training from Student Minds includes an assessment of the trainers delivery, and trainers receive ongoing support and training from Student Minds to ensure they are confident in delivering the workshop. Only staff that have been trained by Student Minds are licensed to deliver these workshops. Can I attend both workshops? If your university run both Look After Your Mate and Mental Health in Sport workshops, it should be fine for you to attend either or both. However, Mental Health in Sport may not be relevant to you unless you are involved in university sport. Check with the trainer/s beforehand to see if the workshop is being run for a specific group of students - this may mean you attend a future workshop instead. There will be a maximum of 30 attendees at a workshop. If you have any concerns about this before attending a workshop, please get in touch with your trainer, who can discuss any access needs you may have. The workshop lasts 2-3 hours, depending on your university. The specific timing will be advertised by the trainer at your university. For Look After Your Mate, of 169 students that took part in our 2016-17 evaluation, 97% said the workshop was ‘very well’ or ‘well’ delivered. For Mental Health in Sport this was 93%. Independent samples t-tests confirmed that there were significant increases between trainee’s ratings knowledge, confidence and skills before and after attending training for both programmes. You can find out more about the impact of our work in our latest annual report.